The iPad has changed a lot of things in the six months since its introduction. A whole cottage industry of game and utility apps has sprung up for the device. Companies are jockeying for position around which technologies will be/should be/never will be supported on it. Publishing houses are scrambling to understand what the iPad will mean for books, magazine, and the web. Magazine publishers are especially interested in the iPad as a platform. The tablet form factor is a natural fit for reading magazines. The iPad/AppStore combo is especially suited as it can allow subscribers to connect to the web, purchase, and download new issues. Sites such as Wikipedia and TED have iPad apps which enable users to view their content in a magazine-ish format. Flipboard has even made it possible for iPad users to create their own personal magazines using content from Facebook, twitter updates, and other feeds. The biggest splash this week was when Victoria’s Secret published the iPad version of their catalog. Along with the photos were videos of the ad shoots, commentaries from the models, and lots of other content. This is definitely not your father’s Victoria’s Secretcatalog. 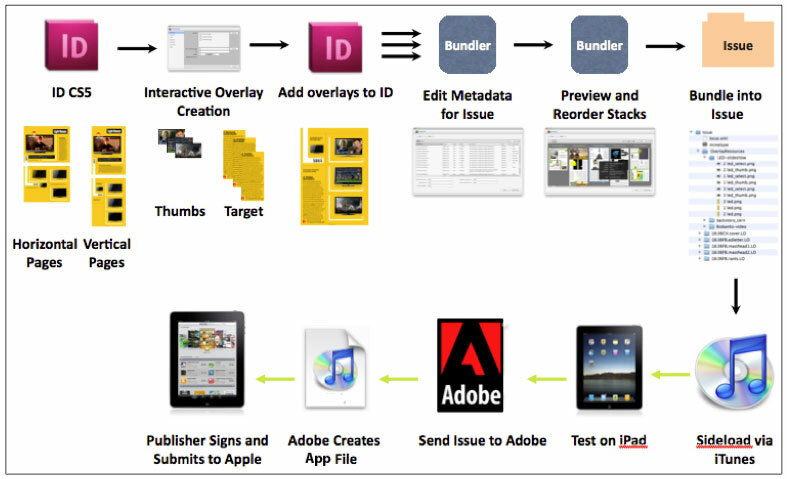 Making all of it possible is the Adobe Digital Publishing Solution. The workflow, consisting of publishing applications, software technologies, and hosting services that allow publishers to create interactive magazines for the iPad, was announced back in February. Things got a bit off-track when Adobe and Apple stared each other down over Flash. Once things cooled a bit and Apple relaxed its stance on apps developed using third-party tools, things have started to move forward again. Wired used the Adobe tools to publish their first iPad issue a few months ago. It was VERY slick and got a lot of folks to see and understand iPad’s potential for magazine publishers. More and more companies are getting on the digital magazine train everyday. Adobe’s solution is centered around the InDesign CS5 application. InDesign is a tool which is used by most publishing houses to layout their pages. To make InDesign work for laying out content for the iPad, Adobe has added a few “glue” applications to package things for viewing on the device. In fact, just by changing the “packager” widget, Adobe can theoretically support any future device. This adaptability is very attractive for authors, content providers, and publishers as it enable them reach the largest possible audience with the minimum amount of effort. The Adobe Digital Publishing Solution is currently in beta and will be available as a product in Q2 of 2011. RainyDayMagazine will be experimenting with Adobe’s Digital Publishing Platform for the next few months. During that time, we’ll be reworking the layout of RainyDayMagazine to make it better suited for viewing on the iPad. Hopefully, by the start of the new year, we’ll have an issue available for download in Apple’s App Store. Like Wired and other publications, there will be content and features which will only be available in the iPad issues. We are very excited about this new venture and know that you will enjoy the new format. Look for it in 2011.